Accurate quantitative tools for the measurement of IL-21 are becoming increasingly important. The IL-21 ELISPOT is an ideal tool to measure IL-21 secretion at the single cell level. IL-21 is a popular cytokine, not only for its biological effects and signaling mechanism(s), but also for its clinical potential. 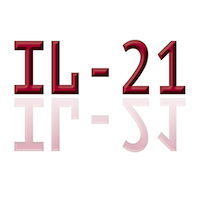 IL-21 is primarily secreted by T cells and natural killer T (NKT) cells, and has diverse effects on a broad range of cell types (including macrophages, B cells, dendritic cells, NK cells and various T cells). Different types of studies have shown that IL-21 plays a critical role in host defense in vivo in humans. However, IL-21 can also play a pathogenic role in various types of autoimmune and inflammatory diseases. U-CyTech’s Human IL-21 ELISPOT kit (cat. nr. CT419) contains all the important reagents (antibodies, conjugate, buffers and substrate) to perform multiple ELISPOT analyses to quantitate IL-21 production. The assay is based on enzymatic staining on PVDF membrane-bottomed plates resulting in red-colored spots. The kits are available in a 2-plate format (including two PVDF plates) and a 5-plate format (without plates).